Over half a century ago, I was stationed at NAS Moffett Field in Sunnyvale, California. One of my fellow U.S. Navy photographer shipmates had at one time, been stationed in Washington, D.C. He took this photograph and allowed me to print my own 8x10 copy of it off of the original 35mm B&W negative. To have actually held this negative in my hand was an amazing feeling. 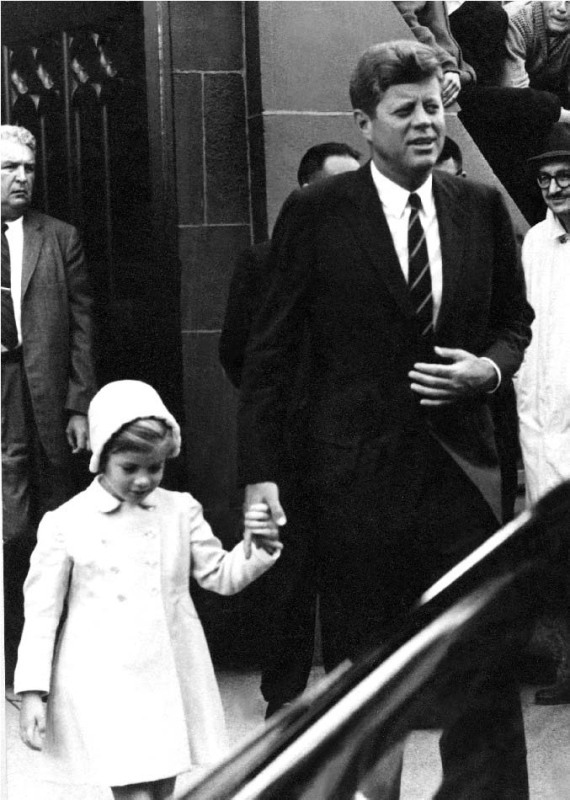 It’s Caroline Kennedy leaving Sunday Mass with her father, President John F. Kennedy. It has always held a special place on my office wall for most of my adult life. I thought some of you might enjoy seeing it. A real time capsule. a touching piece of history! Made my day, Dewey. What a marvelous photo to own! It is truly a treasure to have that photograph! Thanks for sharing! Very nice blast from the past. Do you know what the date was on this? I was wondering how close this was to his assassination. I printed the photograph in 1965.... so, it was after the assassination (22 Nov. 1963). I have no idea what date the actual photo was taken. I thought it was interesting that if you look closely at the man at the far left, in the tweed-looking jacket, it appears that he has some sort of sub machinegun under his jacket. I was 2 years old. In the yrs before I was in school I remember family speaking of it. For those of us old enough to remember the actual day the assassination took place, it's a time we will always remember where we were, what we were doing and who we were with. Such a terrible national tragedy. So many conspiracy theories, but no one will ever convince me that LHO pulled it off alone, with that old POS rifle and scope! This statement was not meant to start an argument or any conflict. Just the humble opinion of a man who many consider a true, bonafide marksman. On a related note. A friend spent years researching this and loaned his notes to someone. This was precomputer days. The someone lost all the notes! I love great shots of famous people going about their daily life.